Share the post "A Little Horsey"
The week ended with the sale of another one of my listings and I believe the home will be a great fit for the new buyer. Many people looking for homes in Mason City don’t take the time to investigate the advantages of living near East Park and the swimming pool. Since I’ve been spending more time up in that area with recent sales along with another project I’ve been working on, I’ve really grown to like that neighborhood very much due not only to it being near all the walking areas of East Park and the Winnebago River, but also how neighbors really are neighbors in an old fashioned way. It’s not uncommon for people who’re out walking their dogs or riding their bikes to either wave or stop for a moment for a little chat. There’s one particular rental in that area which has become very much out of place. It seems there’s more clothes and furnishings outside than there are in. Every time I drive past it I think, “What must the surrounding neighbors think about that mess?” The craziness about it is that it’s owned by a person who lives in one of the ritzy neighborhoods of our City. I wonder what their own neighbors would think of them when knowing how they’ve allowed blighting in another neighborhood. I think with many of the landlords it’s the idea that, “As long as it’s not happening in my backyard, I don’t care.” This brings me to a conversation I had with a dear one who raised her family here, moved away, and then came back to purchase, and now thinking of moving away because of what she’s noticed happening around town. She said and I couldn’t help agreeing, “People’s yards are terrible, they leave junk out on their porches and front yards, and they don’t even want to hang normal curtains on their windows. Instead they hang ragged sheets and blankets.” I agreed and added, “Yes, and they couldn’t get enough money together to buy used lawnmowers and some cheap curtains at Walmart. Instead, we see them out on their porches with one hand eating spaghetti with their fingers while with the other playing on their smartphones, and believe me, I’ve seen it.” I did mention to her how much our country has changed to where you really can’t get away from it unless you live in a gated community and have daily necessities delivered to your door. I can’t stress the need for more public awareness to where people who’re not making an honest attempt at keeping their surroundings presentable, then they need to be made accountable. The turning of blind eyes should no longer be acceptable. I do hope she chooses to remain here. 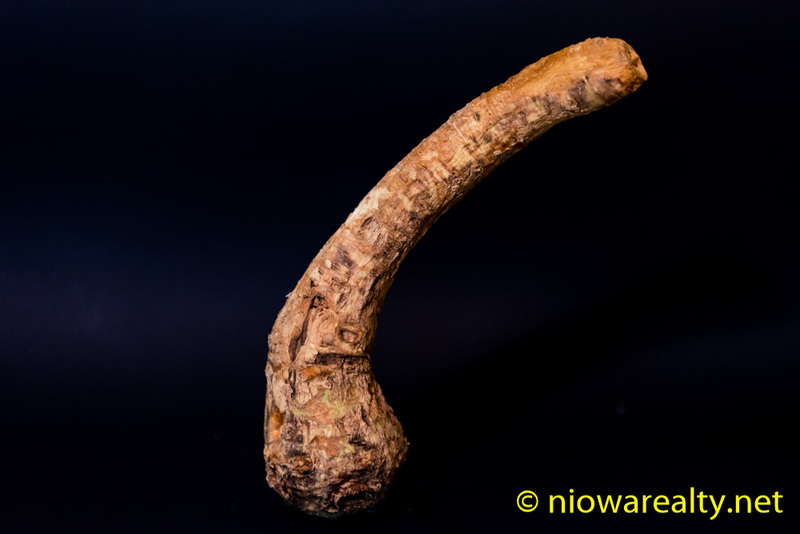 One of my clients insisted I take a horseradish root she purchased at a store. I didn’t have the heart to tell her I have horseradish plants of my own. Not only do I harvest them from time to time, they also make very attractive garden borders and backdrops. Ingredients. 1 Lb of horseradish root, 1 cup of distilled white vinegar, 1 tsp. Salt, ½ tsp. Sugar, 1 small turnip, peeled and cubed. Scrub and peel the horseradish, cutting away any dark parts and then cut into cubes. Place half of the ingredients in a food processor or blender. Process until uniform in texture, adding more vinegar if needed. Add remaining ingredients, continuing to process until smooth. Place in a glass jar, cover tightly and refrigerate. Since I’m familiar with horseradish and it’s varying uses, one can create many different sauces with it once it’s been peeled and finely grated. You can mix it with sour cream, mayonnaise, mustard, catsup, and even ranch dressing. I’ve always liked it as a condiment with red meat—especially roast beef. It can also be added to pickled beets or any other canned vegetables. It has infinite uses and after a while, it becomes a near necessity on the table. The above photo is of the big root of horseradish she gave me. It’s a monster! Words of caution: Make sure when peeling the roots along with the processing of them, you take care to keep your hands away from your eyes and don’t be surprised if your nose starts running as your surroundings start smelling a little horsey.